SHERIDAN, Ark. — Three seniors attending Sheridan High School have received certificates stating they are finalists in the National Merit Scholarship Program based in Evanston, Ill.
“It is a rare occurrence to have three National Merit Finalists within the same school year. I am honored to support these outstanding seniors and wish them well as they move forward into promising academic careers,” said Roy Wilson, Sheridan Schools Gifted and Talented / Advanced Placement Coordinator. Names of 16,000 semifinalists nationwide were announced last September based on excellent qualifying scores on the PSAT that students completed as juniors. About 90 percent of the announced semifinalists were granted finalist status. The selection of around 7,400 Merit Scholarship recipients from more than 15,000 finalists is now in progress. In March, the National Merit Scholarship program will mail scholarship offers to the next round of qualifying students. Earning National Merit Finalist status in 2016 are: Sarah Handloser, daughter of Mick and Kim Handloser of Sheridan; Dylan Thompson, son of Jason and Dawn Thompson of Hensley; and Nathanael Grimes, son of Keith and Missy Grimes of Grapevine. After high school, Handloser plans to attend Arkansas State University, where she received the A-State Scholar Award in the amount of $60,000. She wants to major in International Business and participate in the Honors program, and eventually attend law school. 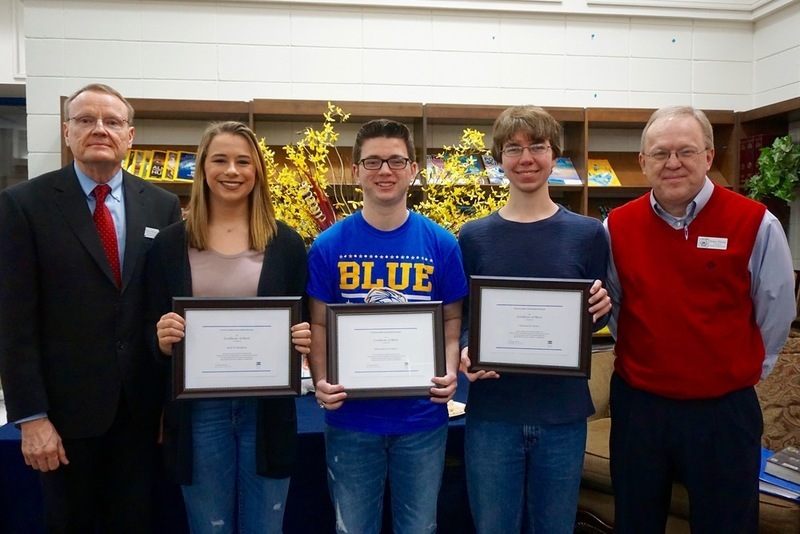 Picture Caption: National Merit Finalist Honorees—On Tuesday, Feb. 16, three seniors from Sheridan High School received certificates citing their selection as National Merit Scholarship Finalists. From left are Roy Wilson, GT/AP Coordinator, Sarah Handloser, Dylan Thompson, Nathan Grimes, and Rodney Williams, Principal.